George B. McClellan (1826-1885) Report on the Organization and Campaigns of the Army of the Potomac to which is Added an Account of the Campaign in Western Virginia, with Plans of Battle-Fields. New York: Sheldon & Company, 1864. Dictionaries define Junto as "A small, usually secret group united for a common interest." In 1868, a group of students of literary inclination formed a literary society. They called it "The Junto", after Benjamin Franklin's famous society which became the forerunner of the American Philosophical Society which has been said to be modeled after the Royal Society. Lehigh Junto maintained a book collection for the students' use in a room in Packer Hall. The society was dismantled in 1874 and later on its collection became the foundation of the new Lucy Packer Linderman University Library in 1878. 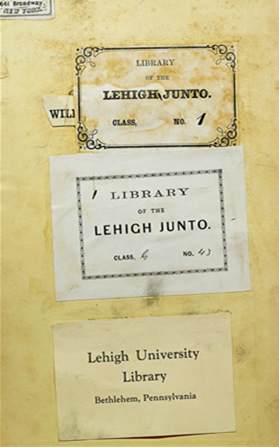 Displayed here is a book with the original Lehigh Junto book plate and the Linderman Library stamp that was stamped after the transfer in 1878.